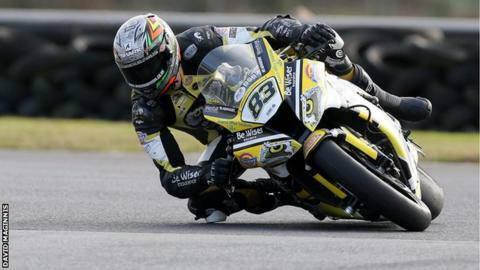 Essex rider Danny Buchan has retained his Sunflower Trophy crown at the Irish short circuit meeting at Bishopscourt. Riding an MSS Kawasaki, Buchan won the feature event of the meeting from Alastair Seeley and Keith Farmer. Buchan also won both Superbike races, with Farmer and England's Ben Wilson both taking a runner-up position. Glenn Irwin took the flag from Gearlink Kawasaki team-mate Wilson in both Supersport 600cc events and also took victory in the two Supertwins races. Irwin was on board a Kawasaki 650 prepared by John Burrows's BE Cookstown Racing team. In the main Sunflower race, Nico Mawhinney, Wilson and Irwin made up the top six leaderboard. Former British Superstock 1000cc champion Buchan began the day in style by seeing off Morello Kawasaki mounted Farmer in the Superbike event, with Seeley, on a Tyco BMW, having to settle for the final podium place. Seeley secured another rostrum spot by finishing third in the first Supersport 600cc outing, with Andrew Irwin, brother of Glenn, completing the podium in race two. The final Superbike outing of the day saw Buchan post a new lap record of 99.438mph on lap three of six on his way to success. Wilson was second on this occasion, with Farmer third and Seeley fourth.